At times when surveying, it is very difficult to inspect all areas where plumbing is concealed but occasionally it is possible to remove a bath panel. We recently inspected a property in Worplesdon near Guildford in order to carry out a Full Building Survey. The house had been converted and finished over 12 months ago but the en-suite bathroom had never been used. 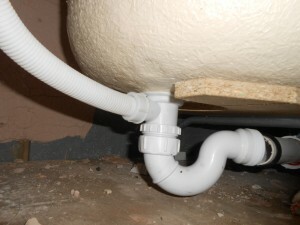 The standard of plumbing installation was untidy and was a disaster waiting to happen as the waste pipes had not been connected and the first person to use the bathroom would have flooded the floors and caused damage to the accommodation beneath. In this survey recommendation was made for a plumber to check every pipe in the property before any of the plumbing was used.